Influenced by Russian Orthodox country chapel architecture, this house is built in its style and setting as a reflection of the painting ‘Beyond Eternal Peace’ by the Russian mystic and painter Isaac Leviton. Alexander Zuckerberg was an Estonian, educated in Czarist Russia as a civil engineer, a self-taught cabinetmaker and sculptor. After Alexander Zuckerberg’s death in 1961, the island and its buildings deteriorated for 20 years until it was purchased by the city in 1981. In the spring of 1983 the Castlegar Rotary Club began developing it as a park. They dedicated it in September 1983 and continue to maintain an interest in it. At the end of 1983, the Heritage Advisory Committee was established to restore the buildings and grounds. The Castlegar and District Heritage Society is now responsible for ongoing island maintenance and operations. Stump Woman an unusual sculpture of a seated woman carved from a stump is one of Zuckerberg’s best known works. He had many sculptures lining island pathways. Around our island park and discover a heritage of human and natural history unique within the Columbia River Valley. Your visit will take you back several thousands of years when the Lakes Salish Indian people first fished and built their winter pit houses here; almost 200 years ago, in 1811 when David Thompson canoed down the Columbia River past this island; and 60 years ago when Alexander Zuckerberg built his unique Russian Orthodox Chapel House. For the young and young at heart there are over 8 hectares of woods and a variety of paths to explore. You may select from many picnic tables and benches for lunching and relaxing. How to get to the park Drive towards downtown Castlegar on Highway 22 (Columbia Ave.) Turn right at the Forestry station on the corner of 8th Street. Proceed to the 4-way stop on 7th Avenue and follow the signs. Suspension Bridge Built as a field exercise project in 1984 by the 44th Field Engineer Squadron, the bridge was allowed to remain in place as a connection to the island. 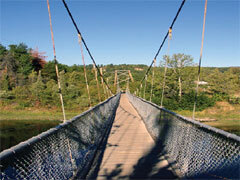 The 473 foot bridge won the coveted Canadian Militia Herztberg Award. All materials for the bridge were donated.